Item consists of two copies of a drawing of the propulsion shafting of the Bluenose II. 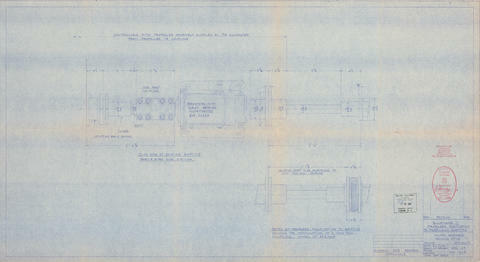 The drawing includes a plan view of the existing shafting and a detail of the proposed modification, showing the installation of a twin disc coupling. The drawing was completed by G. T. Nelson from the Halifax Shipyards Drawing Office on September 23rd, 1965. The drawing is labelled "DRG. No. MX-625." Both copies of the drawing are stamped and dated by Halifax Shipyards. One copy has a stamp of approval from the Canada Department of Transport, which is dated October 4th, 1965.